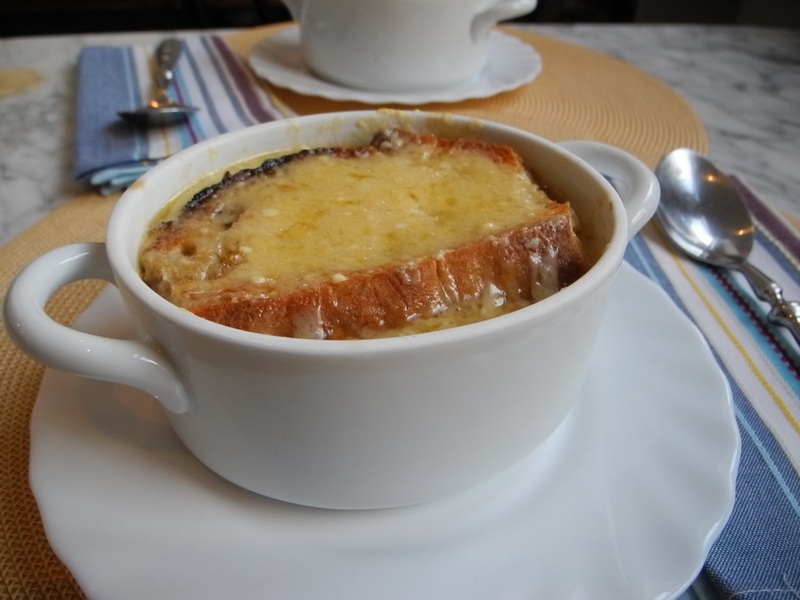 This week’s French Fridays with Dorie recipe, Cheese-Topped Onion Soup, is a bistro classic and a personal favorite. There is simply nothing better than a warming bowl of soup on a cold winter’s day. Onion soup requires very few ingredients and is not at all difficult to make, but it does require lots and lots of patience. First you have to slice up all those onions. 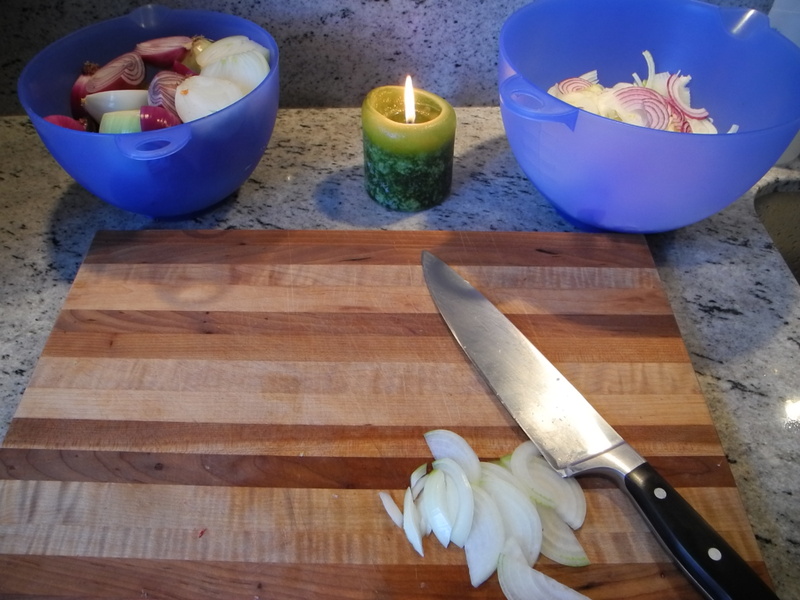 Anytime I have a large amount of onions to slice I light a candle by my cutting board in order to try to prevent tears. I honestly have no idea how sound the actual science behind this theory is, but I have always found it to help. Dorie’s recipe in particular took longer than others I have made in the past. She calls for you to caramelize the onions on “the lowest setting” for an hour or more. I don’t know about your stove, but the lowest setting on my stove is barely strong enough to keep food warm, much less cook it. So I cooked my onions on setting 4 (out of 9) and my onions took about two hours to caramelize. I think that next time I will use setting 5 and call it a day. Patience is a virtue which I have long struggled with. Otherwise Dorie’s recipe seems to be very similar to others I have used, and more importantly, it is delicious. Topping the soup with toasted bread and melted cheese makes it hearty enough to serve on its own. This is comfort food in a bowl my friends. This entry was posted in french fridays with dorie and tagged Around my French Table, seasonal - winter, soup. Bookmark the permalink. Wow – you have really been cooking up a storm! I’ve missed some recipes, too, but only plan to catch up on a few of them. We loved this soup, too, and will definitely make it again! I think that it’s a type A personality thing, once I have a list in front of me I have to check off all the items. It’s also why I am only signed up for one cooking group, I can only handle one at a time. Wasn’t this one great? Perfect for the wintry weather! I have a gas stove and kept things on medium heat and it took about an hour to get the onions where I wanted them. LOL, I think Im going to use medium heat and be really diligent about caramelizing the onions when I make this the next time so they dont burn. But I’m with ya, this low heat business is excrutiating! At least we all got something delicious out of it! I used low heat and after an hour the onions weren’t brown at all. Not my favorite recipe so far!! You weren’t kidding about the patience. When I read the recipe, I definitely planned on caramelizing on a different day. I would’ve pulled my hair out otherwise! Your soup looks fantastic. I made this once before, and it took me three hours to caramelize the onions. This time, I brought it up to “5”, and it took an hour and a half. Definitely a process! that. Your photo looks so pretty and the soup delicious. I wish that I could have a gas stove too, but not an option in my apartment building. I find it so much easier to work with, but at least we have an induction stove which I find works a little better than electric. Your soup looks great! I have gas and lowest was way too low. Bumped it up to medium low and it was still too low. Gave up after 2 hours and 50 minutes and made the soup but didn’t care for it. I’m gonna try again Saturday and I’ll be sure to try the candle! Well I guess that kills my theory. 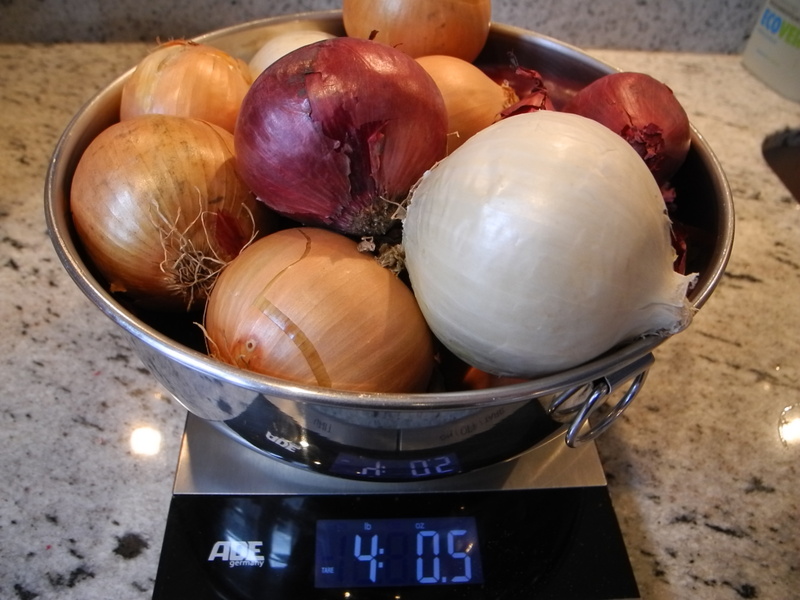 I have no ideas, I just know that there is no way my lowest setting would have ever cooked these onions. Medium-low is what I have used in the past to caramelize onions and that is what I will be sticking with in the future. I was getting desperate at around 7:15 last night so I bumped up my heat too. I think the lowest setting is too low for my stove. Your soup looks great! I have to get some of those soup cups with handles. We had them when I as growing up and I loved them! Looks great! I’m going to try the candle trick next time. I thought this was great too. My stove is a lot like your! I used setting 6 and it still took over an hour. But you are right, it’s delicious! Your bowl looks great! Hah, the number of us who struggled with patience on this one is hilarious. We all seemed to need much more time than Dorie suggests (or we gave up and threw in the wine to early!). Beautifully done! And I totally agree about the lowest setting barely cooking…I cranked it up, but I should have done it a lot sooner! Hi Rose, I tried to find FFwD on facebook but I’m having no luck. Can you give me more info? Thanks! It took my onions about 90 minutes to caramelize and, yes, it does require patience. I put my gas burner on a very low burn. But, the result, like yours, was great. Go slow, it must be. I agree – this soup is just devine. I would have been bored caramelizing onions for two hours – I salute you for taking this time, as I would have been so tempted just to crank it up and risk burning. Thanks for the tip about the candle! Even if there’s no scientific basis for it, it might help and would definitely help with my impatient mood problem. I love the little tureen-shaped bowls! Love your soup bowl. I had the hardest time deciding what bowl to use and ended up using an oversized mug. Caramelizing took 2 1/2 hours on my gas stove. Probably could have gone longer but it was getting late. Your soup looks great. Great looking soup. I didn’t make this earlier in the month when it was cooler, and had a hard time finding motivation in 90 degree weather to eat such a hearty soup. Major guilt. Love how it looks. Some recipes just really seem to demand a certain kind of weather and this one demands cold weather. I can’t imagine enjoying this soup in 90 degrees, it would just seem out of place. But you should definitely give it a try once things cool down. Your soup looks picture perfect! I cooked mine on 7 (out of10) but had to stand nearby to stir and stop it from burning. And that took a good hour and a half! It was worth it though! I’ll have to keep the candle trick in mind – I suffered a lot cutting the onions for this soup! Apparently, the science is that the gas that’s released by the onion is consumed by the candle’s flame. Your photos looks great! I totally agree, this is comfort food in a bowl, for sure! I always cry when I cut onions, always, and I’ve never heard of the candle trick, but you can bet I’m trying it on my next onion. Your bowl of soup looks fantastic. Your soup looks beautiful. I am a late to the party this week, but I am so glad that I made this. French onion soup is also a personal favorite of mine and it was the first time I made it. Next time I will start earlier in the day. Your soup looks so delicious and perfect! Just like the bowls you get served in a restaurant! Yeah for you for doing all that catch up! I’m going to be catching up with this one soon…can’t wait!